It’s no secret that yoga is a popular activity these days. From gyms, to studios, to schools, the practice is becoming all the more mainstream and taking on new and varied forms. One of the wonderful things to come out of the yoga craze is the accessibility for children. Teaching yoga to children opens the door to a lifelong practice that nurtures healthy bodies, minds, and spirits. That being said, if you’re thinking of practicing yoga with your youngster or teaching a class to children, be prepared to shake things up a bit. While many adults turn to yoga to find peace and release tension in their bodies, children are motivated by one overarching factor: fun. To peak their interest and keep them engaged, it’s important to present kids with fun and exciting poses. Once engaged, we can begin to weave in breathing and meditation exercises so that they can also reap the wonderful benefits that yoga has to offer. Any pose that has an animal name is wonderful because it conjures playful, relatable imagery that helps yoga feel more like play. From their hands and knees, walk them through dropping their belly and looking up for Cow Pose, and then arching their back like an angry cat for Cat Pose. Once they master this fluid motion, incorporate the breath, encouraging them to breathe in with each Cow, and out with each Cat. This variation of Child's Pose where the tailbone is raised high above the heels is a wonderful stretch for the back and shoulders, but also a good opportunity for introspection. While looking down at their mat and not at the other children in the room, or any other distractions around, it’s easier for kids to turn inward and settle down. Teaching Tree Pose to children has a beautiful way of showing them their own inner strength and focus. As we describe the deep roots of a tree, we help kids to stand tall and proud, reminding them that they are each strong, wonderful individuals. As we lead them through the balancing portion by pressing the sole of one foot into the inside of the standing leg, we show them how focus and determination bring great rewards. What kid doesn’t want to fly? This challenging pose keeps kids engaged as they use all the muscles in their body to steady their airplane. Balancing on one leg, kicking the other behind them, and extending both arms like wings, kids can imagine they are flying high over their city, or wherever they can dream to be. This pose has it all: an animal name, a wonderful stretch, and a partner to play with. Partner poses are an great way for kids to learn together, build trust, and get creative. For this pose, have the partners sit on their knees, back to back. Have one come to Child’s Pose on the mat with their tailbone on their heels, forehead on the mat, and arms extended beside their head. The second child comes into a high squat, then raising up to sit on the other’s tailbone before leaning back and draping themselves over their friend. The result is a wonderful heart opener, but also a silly pose that bring lightness to the practice. 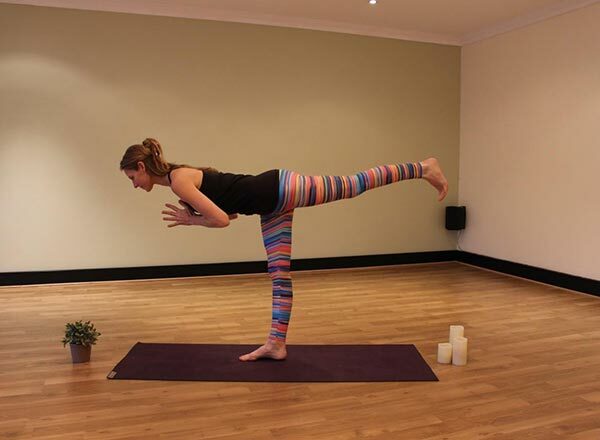 With a number of variations, this pose is a great offering for children of all ages and levels. Sitting on their mat with their feet a foot or so in front of them, have the kids place their hands behind them and point their toes they barely touch the mat. Then, they can play with lifting their feet off the mat and raising their arms to reach out in front of them. From here, you can tap one foot to the mat and then the other, straighten both legs, or even twist the upper body from side to side. The challenge here is to keep breathing — just as we need to learn to breathe through difficult situations. While many kids are resistant to napping and can find it hard to lay still, especially when their friends are near by, this pose is so important for everyone to incorporate into their yoga practice. From this relaxing position, laying on their backs, it is the perfect time to introduce breathing exercises to children. Just like the names of the poses themselves, there are plenty of kid friendly breathing games that help them slow down, connect with themselves, and help them learn to listen to their bodies. These poses are just the tip of the iceberg when it comes to sharing yoga with children. Kids bring a special lightness to the practice, an uninhibited joy that makes them eager to try new things and get into funny positions. As yoga teachers, or parents, we can take advantage of this enthusiasm to integrate the invaluable lessons that yoga has to offer. After all, yoga is really a mirror for life, what we cultivate on the mat, we use in our daily reality. Encouraging kids to find balance, calm, and strength makes for healthier, happier children, and what more could we wish for them?